The clothing industry is often polluting and non-sustainable, how do you ensure you're not part of the problem? Links to clothing brands that are making an effort, saving you from having to become a detective every time you shop. Bluesign - an environmental health and safety standard for textile manufacture. A Swiss based organization that independently audits textile mills, examining processes from start to finish. Suggestions are made to reduce consumption and eliminate harmful chemicals and processes. Textile mills verified as adopting Bluesign recommendations can become certified System Partners and attract business from a wide range of brands and retailers around the world looking for greener vendors. 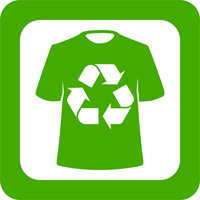 The sign is applied to individual garments rather than a brand as a whole and goes some way to verifying sustainability. Items that will last and you want to keep wearing = fewer items = less impact at every stage. Avoid cheap, disposable "fast fashion"
Prevent new items being made, save money and still wear your favourite clothes. Brands that are fairly widely available that have some sustainable credentials. There are a growing number of manufacturers who make the effort to be more sustainable in making their products, there is no universally recognised definition of what this means and it covers a range of factors. In the absence of any universal definition or agreed criteria, it is difficult to compare directly. Comments such as "Committed to sustainable and ethical practices", "Continually improving our methods and decreasing our environmental impact", "Working towards..." are positive sound bites that are in widespread use, but don't in themselves tell you what is actually happening today. I have selected these on the basis that they are doing something - right now - today, though that something cannot easily be measured against others, as ever, the only guaranteed way to not be part of the problem is to consume less. The list is not exhaustive by any means, these are brands that can fairly easily be bought online and have been around for some time so they tend towards bigger companies. There are many small garment producers that operate in sustainable and ethical ways too, though are often too small to be easily found or not large enough to be stable yet and might not be around for long.